Koko creates unusual, colorful and as she says “non-boring” candles. 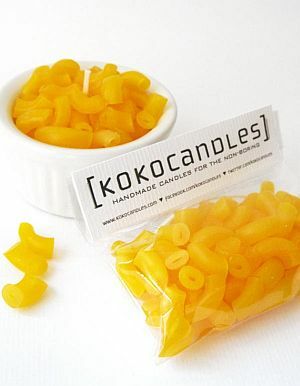 The macaroni and cheese candle pictured here was featured in the Food Network Magazine. She patiently makes each of the noodles by hand! You get to assemble them yourself once you receive your candle kit and instructions. I quite admire her creative and playful approach. You can check out more of her yummy candle creations at her Etsy store, KokoCandles.